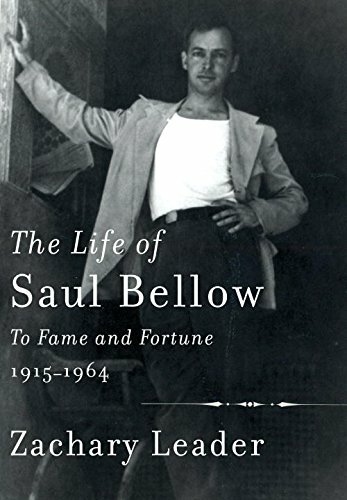 As he lay dying, Saul Bellow, “the most decorated writer in American history,” slipped back into consciousness, looked up, and asked, “Was I a man or was I a jerk?” Somewhere within that sentence lies Bellow’s greatness as a novelist—his fabulous sense of wonder and entitlement about himself, coupled with a magical gift for language and a rattling insecurity. This is what Zachary Leader writes about in his doggedly detailed and adoring biography of Bellow. Bellow was everyone’s darling for quite a while. The youngest son of a poor immigrant family, he supposedly read Tolstoy at his mother’s feet by the time he was ten. He was the handsomest boy in his Chicago high school class. When he married Anita Goshkin at the age of 22, his in-laws treated Bellow like a princely rabbinical student, but instead of studying Torah, he studied the torah of American script—he was trying to write a novel—while his wife went to work. Those words could have come right out of Augie March and tell us almost as much about Bellow as any book about his rise to fame and fortune. “I am an American, Chicago born,” Bellow insists in the opening line of the novel. But Bellow was born in Quebec and was smuggled out of Canada by his father’s tribe of bootlegger friends when he was nine years old. His father came from a shtetl on the border of Belarus and Latvia, moved his family to St. Petersburg without a residence permit, and finally had to flee the czar’s police. Abraham was always on the run. And that might also describe his youngest son’s strategy of fiction—the best of his writing, Saul insists, was formed in a series of jumps. But most important, Bellow was born into a babel of tongues—Yiddish, Russian, the French argot of Montreal, and the tough guy slang of Chicago. Without these idiolects, and many, many more, he could never have revitalized the American novel and turned it into Bellow country. That little schemer was a refracted image of Saul himself. “Subject and language appeared at the same moment,” and The Adventures of Augie March was written in a great melodic swirl. Bellow needed the foreignness of Paris to unbridle him, free him from all literary restraints. At the same time that he was writing and revising Augie, he also translated for the Partisan Review a short story, “Gimpel the Fool,” by an utterly unknown Yiddish writer, Isaac Bashevis Singer, who scratched out a living as a scribbler of novels and feuilletons for the Forward. “Gimpel” arrived like a thunderclap with its sinewy language and a narrator who was a sainted fool. Singer soon found an avalanche of readers. But Bellow’s translation tells us as much about the miracle of Augie as it does about the marvels of Bashevis Singer. The audacity and monstrosity of the novel is a stunning rebuke to the Master, Henry James. In The American Scene (1907), James writes about his visit to the Lower East Side of Manhattan in 1904, with its bustling Yiddish cafés, which were “torture-rooms of the living idiom,” where the English language itself was at stake. Almost 50 years later, Saul Bellow, another master, would prove him wrong—the bold syncopations and hothouse of tongues in Augie have enriched—and remade—the English language, rather than ruined it. This is Bellow’s real tale, not his rise to fame and fortune, as the subtitle of the biography suggests. Jerome Charyn’s latest novel, I Am Abraham, was just reissued in paperback. In June, Liveright will publish Bitter Bronx: Thirteen Stories.